In order to provide for the varied needs of today’s agricultural and rural sector PJN has designed a variety of practical sheds that have the strength and durability necessary for our environment. PJN have standard design buildings spanning from 9 metres (30') to 36 metres (120') with an adaptable range of lengths and heights which allow for roof only buildings and haysheds, 3 sided machinery sheds, partially enclosed buildings to allow for workshops or fully enclosed. 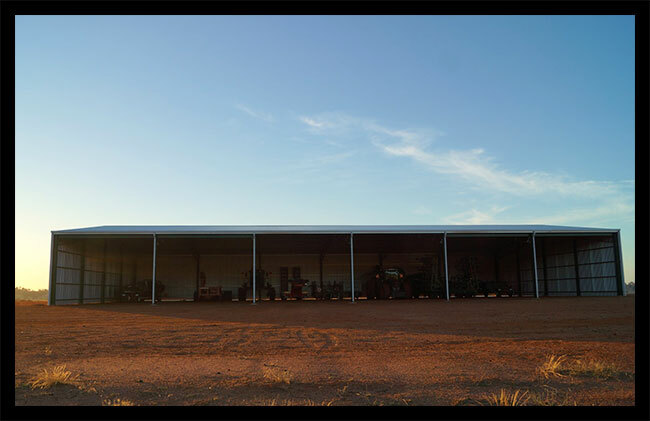 Our standard range of sheds have been designed with maximum efficiency in mind which in addition to our buying power and extensive in-house production facilities helps to ensure you are obtaining the best possible price for such a quality product. Our standard range of sheds come in 6 metre (20'), 7.6 metre (25') and 9 metre (30') bays. To ensure that your shed is suitable for its requirements we can provide a variety of quality components such as sliding doors, roller doors and shutters (manual, chain operated and automatic), personal access doors (all firelock fitted), various insulation, mesh, windows, vents and skylights. For those with special requirements, for example an opening for large machinery, enclosed workshop or the need for variable size bays, PJN is also has the ability to design and manufacture custom sheds to suit your specific needs. PJN sheds are delivered to your site ready for fully arranged installation by our expert erectors. Our sheds are also suitable for owner builders if required. For your next farm shed don’t miss the opportunity to obtain expert advice and contact the team at PJN for an obligation free quote. We look forward to hearing from you.